SANTA CLARA, Calif. (AP) —It took about 24 hours for Kyle Williams to find a new job. 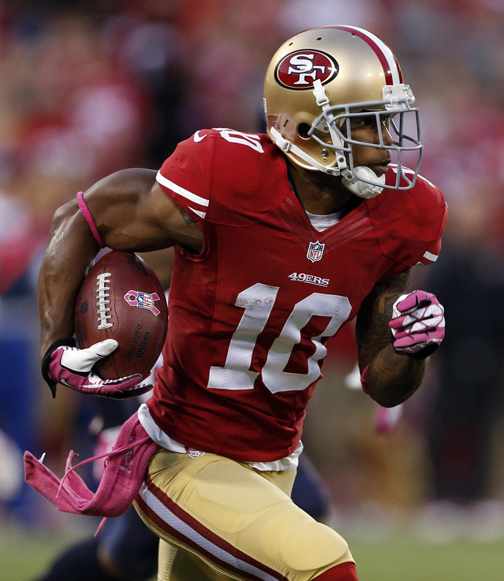 The wide receiver and return man was claimed off waivers by the Kansas City Chiefs on Wednesday, one day after his release from the San Francisco 49ers. Williams’ agent, Wynn Silber­man, said Williams would fly to Kansas City later Wednesday to join his new team and be reunited with former San Francisco teammate quarterback Alex Smith, who has led a turnaround for the franchise under coach Andy Reid. “It’s interesting, certainly, with the Bay Area connection there and being reunited with Alex,” said Silberman, who was confident his client would land with a new team in short order. “He was a good friend. Sad to see him go,” San Francisco quarterback Colin Kaepernick said. Williams missed the late run last season to the Super Bowl — a 34-31 loss to the Ravens — because of a serious knee injury that required surgery. He remained a key member of the team and was honored with the team’s Ed Block Courage Award. The 25-year-old Williams, a native of nearby San Jose, has 12 catches for 113 yards and no touchdowns this season after starting as the No. 2 receiver opposite Anquan Boldin. Williams also had 12 punt returns for 61 yards and seven kickoff returns for 134 yards. A sixth-round pick by the 49ers in 2010 out of Arizona State, Williams returned this season from a torn ACL in his left knee that required surgery and ended his 2012 season in late November. Just when Williams was on a nice roll last year, he got hurt in a Nov. 25 win at New Orleans. He had 13 catches for 212 yards and a touchdown in the first 11 games of 2012. Williams dedicated this season to former Sun Devils teammate Tyrice Thompson, who died Feb. 2 from injuries suffered when he was stabbed Jan. 27 while working at a Scottsdale, Ariz., nightclub. Williams added a No. 81 tattoo on his inner left forearm to honor Thompson. Williams will long be remembered for his two costly fumbles in a 20-17 overtime loss to the New York Giants in the NFC championship game following the 2011 season. That included losing a fumble on a punt return in overtime that set up Lawrence Tynes’ winning field goal. Williams took responsibility for the mistake, but received death threats and was harassed on social media. The 49ers gave him a fresh start last year. In April 2012, a recording came out of former Saints defensive coordinator Gregg Williams instructing players in January to “put a lick” on Kyle Williams to see if he had lingering effects from a concussion he sustained in 2011. The NFC West champion 49ers beat Drew Brees and favored New Orleans 36-32 in the NFC divisional playoffs. Gregg Williams oversaw and contributed money to the illegal bounty fund for planned vicious hits on opponents. Williams will be joining a Chiefs team off to a surprising 9-0 start despite an offense that has struggled to score points. The biggest reason for their ineffectiveness has been the passing game, where wide receiver Dwayne Bowe has been the only big-play option. Bowe is now facing a possible suspension after he was arrested over the weekend for speeding and possession of marijuana. Bowe will play in Kansas City’s game Sunday at Denver. The Chiefs have turned to the 49ers to address their dour wide receiver situation already this season. They claimed Hall when he was released by San Francisco in August, and then sent Jon Baldwin to the 49ers for A.J. Jenkins in a trade of disappointing former first-round picks. None of the moves has worked, though. Hall had just one catch for nine yards while active for seven games, and Jenkins has one catch for six yards in nine games.